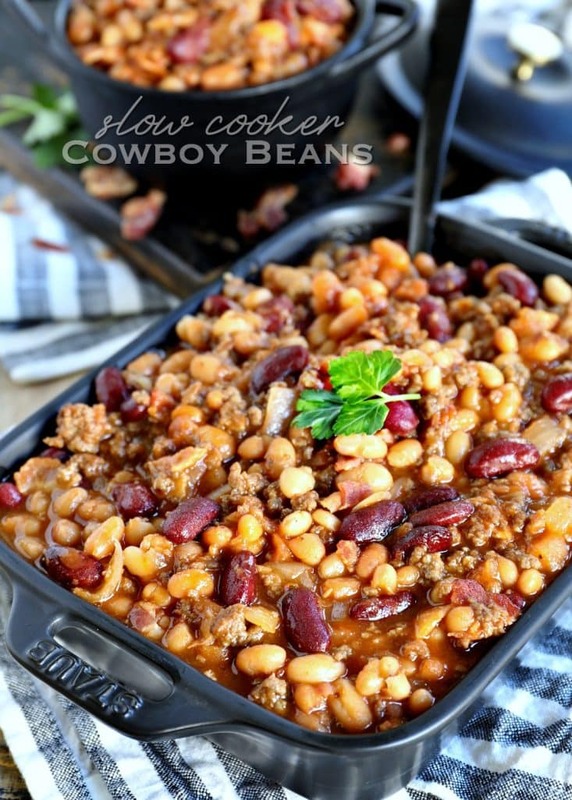 The very best Slow Cooker Cowboy Beans! This easy recipe is so hearty and filling and just perfect for chilly weather! 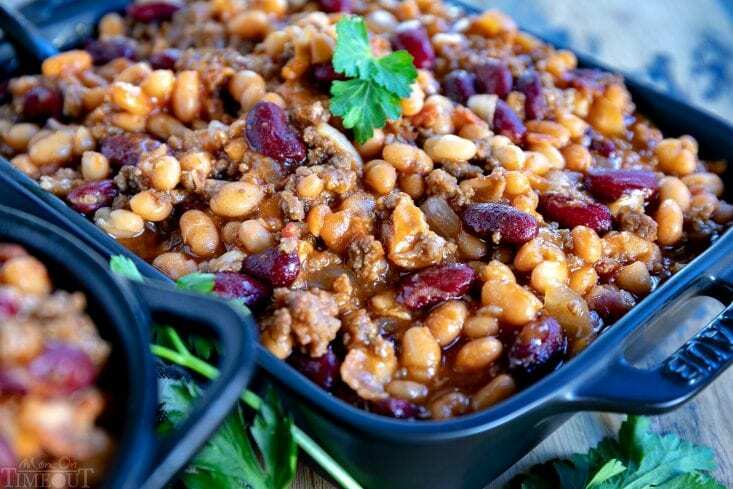 Loaded with three types of beans, bacon, and beef, this family favorite is frequently served up at holiday gatherings, potlucks, and parties and is a must for game day. We love to serve this with Cheesy Bacon Ranch Bread, Best Ever Broccoli Salad, and The BEST Ambrosia Salad for dessert. Delish! You guys. If you’ve never had Cowboy Beans before you’re in for a treat. They are also called Calico Beans or even Calico Beans Casserole depending on your region. What they are is HEAVEN. If you like my Slow Cooker Kielbasa and Barbecue Beans recipe, you’re going to love this one. There are a lot of similar flavors going on in these Cowboy Beans. What Goes Into Cowboy Beans? ground beef – I like to use lean ground beef but any will work as it gets cooked and drained before being added to the slow cooker. bacon – because, why not? No, seriously. 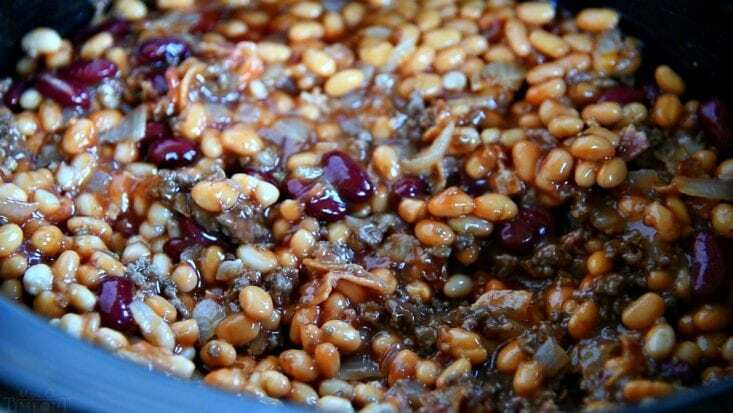 The bacon adds so much flavor to this Cowboy Beans recipe – don’t leave it out! onion – where there is bacon there should be onion, right? white beans – there is some family debate about which beans to use here. Some use butter beans, some lima beans, I prefer white beans. But as you can probably tell, any beans will work here. Black beans would be delicious! pork ‘n beans – you’ll need two cans and they should NOT be drained. Throw the whole can in there. ketchup – helps create the sauce and thickens it a bit. brown sugar – a nice touch of sweetness to balance out all this savory going on here. liquid smoke – it’s the combination of ketchup, brown sugar and the liquid smoke that gives these Calico Baked Beans their “barbecue” flavor. I like to use about a tablespoon, my Uncle Tim uses about two tablespoons. barbecue sauce (optional) – I didn’t add this to the ingredients below but if you’d like, a half cup or so of your favorite barbecue sauce can be added. These Calico beans or Cowboy Beans are not chili but can be treated like a chili would. Therefore, feel free to eat by itself or serve along with Fritos, tortilla chips, sour cream, cheddar cheese, etc. You’re going to love how it’s so filling and leftovers are even better the next day. Can Cowboy Beans Be Made In The Oven? Absolutely! Basically they become “baked beans”. First you’ll need to follow the first three steps in the instructions below using a dutch oven or large oven safe pot. Next, you’ll add all of the remaining ingredients, stir, and place in a 350 degree oven for about an hour. Finally, just serve as you would chili! Serve over homemade biscuits for an easy dinner. Top with Fritos and cheddar cheese for a yummy take on chili. Serve as a side dish on game day along with Spinach Artichoke Dip with Roasted Garlic and Baked Bacon Cheese Dip. Don’t forget the chips! Goes great with these sides: Twice Baked Potato Casserole, Bacon Cream Cheese Deviled Eggs, Oven Roasted Herb and Garlic Parmesan Potatoes, and Ham and Cheese Mini Corn Muffins. More Slow Cooker Recipes to Try! I really hope you give this easy recipe a try! So delicious and hearty and I love how versatile of a dish it is. My boys just gobble it up! 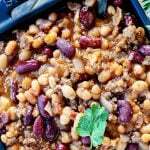 The very best Slow Cooker Cowboy Beans! 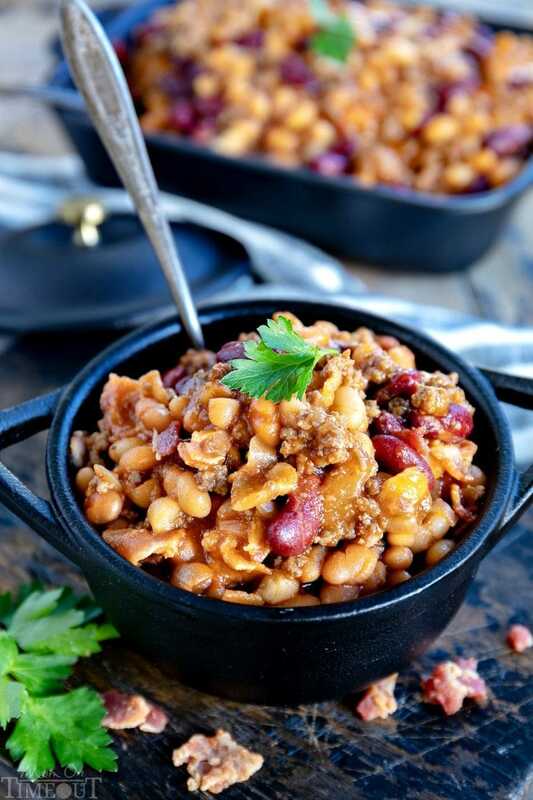 This easy recipe is so hearty and filling and just perfect for chilly weather! 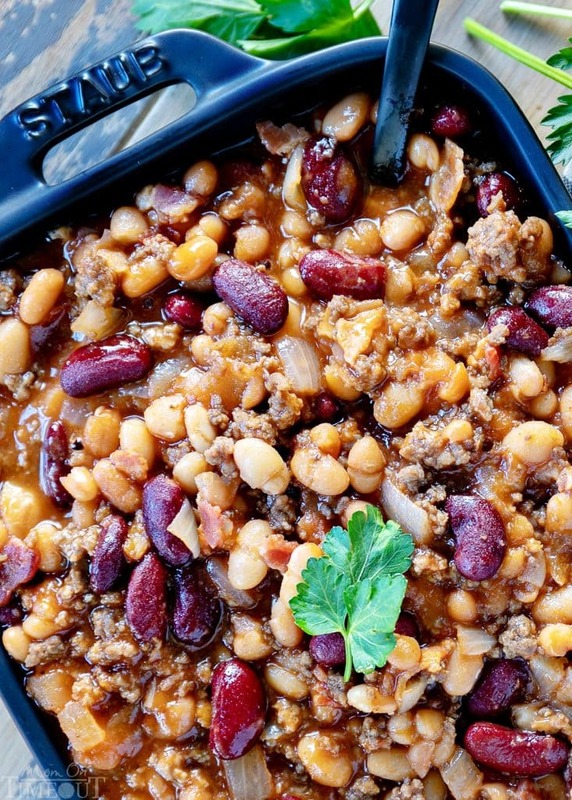 Loaded with three types of beans, bacon, and beef, this family favorite is frequently served up at holiday gatherings, potlucks, and parties and is a must for game day. In a large skillet, brown ground beef. Drain and set aside. Add bacon to the skillet and cook 5 to 7 minutes or until cooked through, stirring frequently. Add onions and cook an additional 4 to 5 minutes or until onions are soft and translucent. Add ground beef and bacon mixture to a large 6 quart slow cooker. Add pork 'n beans, drained kidney and white beans, ketchup, brown sugar and liquid smoke. Stir gently to combine. Place lid on slow cooker and cook on low for 4 to 5 hours or on high 2 to 3 hours, stirring as needed. If the mixture seems a little dry, add a few tablespoons of water. Serve with tortillas chips, corn chips, sour cream, cheese, whatever you want. Anything goes! I made this yesterday for supper only I made it in a cast iron dutch oven on the oven. Very delicious. Will be making it again & again. Excellent way to make them as well! So glad you enjoyed the recipe Guy! Sure can! That would be delicious!